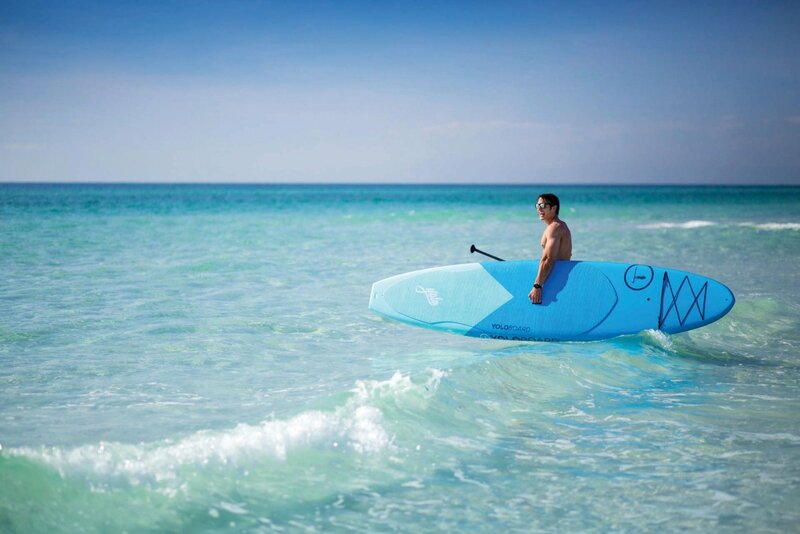 Back in the mid-2000s, the sight of a stand-up paddleboarder gliding her way across Pensacola Bay in the morning sun or navigating Destin Harbor at twilight would have had most people doing a double take. Fast forward a decade or so — particularly one in which there was a recession that drove many to set aside their gas-powered toys for less pricey modes of recreation — and this once-curious pastime is everywhere. Stand-up paddleboarding, or “SUP” for short, has its deepest roots in Polynesian culture, but it first gained mainstream popularity in Hawaii in the late 1990s, when big-wave surf legend Laird Hamilton and others used it to oversee surf classes. Today, people of all ages, backgrounds and physical abilities are using SUP to pursue a wide range of adventures, from backcountry expeditions to tournament fishing to cruising their local bay. Paddleboards are sleeker, lighter, tougher and even more inflatable than ever before, and they’re also readily available at big-box stores and popular online retailers. Florida’s Emerald Coast is no exception. In fact, it’s home to two major players in the SUP industry: the pioneering YOLO Board, which started in Santa Rosa Beach, and leading innovator BOTE Board, out of Destin. When YOLO Board Founder Jeff Archer describes his introduction to SUP, it makes perfect sense that he went on to build one of the most successful brands on the market. Fueled by their motto, “You Only Live Once!,” Archer and his team started YOLO Board in 2007. For many coastal residents, paddleboarding is more than just a hobby; it’s a lifestyle. With the most popular brands, YOLO and BOTE, housed along our emerald shores, a SUP is a staple in most beachside households. Ten years later, YOLO Board has become known worldwide for paddleboards that are not only highly functional, but works of art in the eyes of their customers. Bold colors are paired with YOLO Board Creative Director Jake Meyer’s custom designs to reflect the company’s love of nature and adventure — whether that takes the form of touring, fishing, yoga or racing. In 2017, YOLO Board will introduce 17 new board models in celebration of its 10th anniversary. 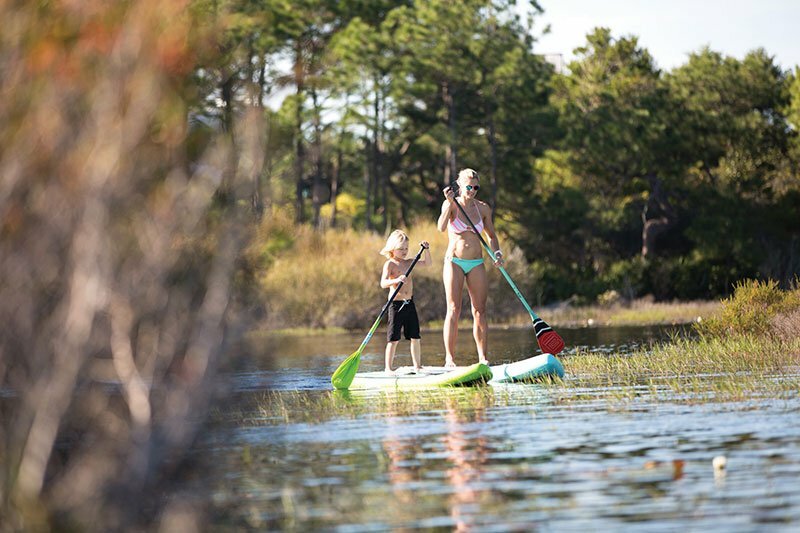 Archer’s team of employees happily spread the SUP gospel, holding beginner’s classes, offering tips and answering questions at its main retail store, YOLO Board & Beach, on U.S. Highway 98 in Miramar Beach and at YOLO Board & Bike on 30A in Santa Rosa Beach. The company also has expanded its YOLO Adventures program through which it partners with other brands, communities and resorts to provide activities such as kids’ camps and SUP yoga. With SUP at its core, YOLO Board has grown into a full-scope lifestyle brand, thanks to those loyal and close-knit customers. In 2009, Corey and Magda Cooper, two water-loving Auburn graduates who fell hard for the Emerald Coast, launched BOTE Board. Their aim? To improve and customize what was out on the water. “The stand-up paddleboard market wasn’t really, per se, a market,” Corey says. “It was essentially an off-shoot from surfing. People had started making bigger surf boards to stand-up paddle. What I really wanted to achieve was a hybrid vessel.” At the time, the country was also reeling from an economic downturn, and folks were spending less money on recreation. “This was a very simplistic and minimal way to get out on the water and enjoy what our area offers,” he adds. After eight years in business, BOTE Board now sells to more than 350 retailers across the country and is known for simple yet groundbreaking advancements in customization. While rugged enough for duck hunting and fly-fishing, the boards are also stylish and unique, with vibrant color schemes and wood inlays, and easier to carry than ever before. The Coopers love hearing about their customers’ adventures and innovations, and like YOLO Board and so many other brands today, they showcase those stories on their company website. “That’s how you keep something going and moving forward,” Corey says. Ultimately, for many locals, SUP has become a fun, affordable way to interact with the local environment. “It literally opens up a whole new world to you,” says Jason Kelts, a Fort Walton Beach resident and avid paddleboard fisherman. Stand-up paddleboarding also offers an up-close look at marine life. “We’ve had dolphins swim right underneath us. We’ve gotten in the middle of hundreds of ducks,” says Mark Wise, who tried SUP with his wife Anita about 10 years ago during a vacation in Blue Mountain Beach. Now the Pensacola Beach couple is out on their boards every couple of weeks in Santa Rosa Sound.